By Kevin Wong, D.O., Michael Swofford, D.O. A patient with progressive memory loss presented for neurodegenerative disorder evaluation using F-18 fluorodeoxyglucose (FDG) PET/CT. 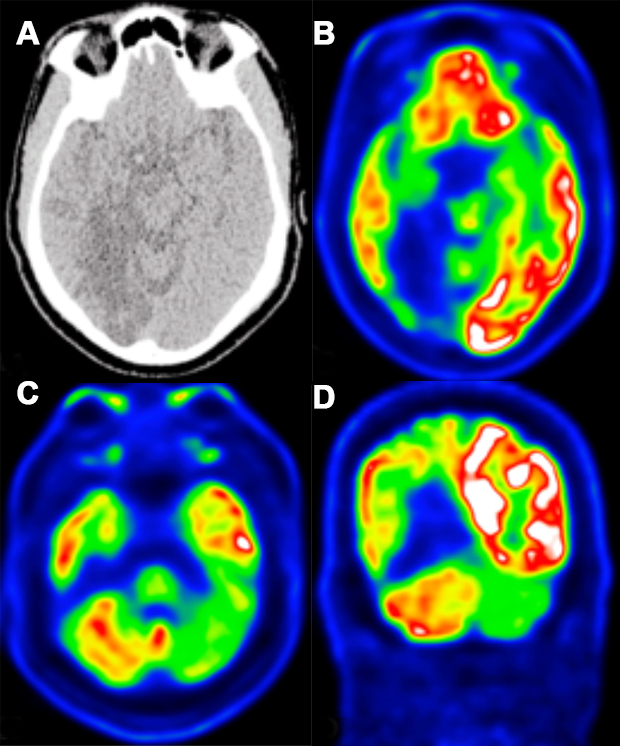 CT (A) demonstrated a right cerebral infarct in the posterior right temporal and occipital lobes with corresponding hypometabolism noted on PET (B). A second region of hypometabolism is present in the left cerebellar hemisphere (C, D), contralateral to the infarct. Crossed cerebellar diaschisis (CCD) is an imaging finding encountered in nuclear neuroimaging in which cerebellar hypometabolism or hypoperfusion is noted contralateral to a supratentorial cerebral process, most often infarction.1 However, a variety of processes have been associated with CCD, including tumors and hemorrhage. CCD can be identified on both SPECT and PET. Regardless of whether it is a perfusion or a metabolism study, the decreased uptake in the contralateral cerebellum is thought to relate to a disruption of the corticopontocerebellar neuronal pathways.2 This results in a functional abnormality in a region of the brain that is separate from the pathologic process. CCD is considered an incidental finding and has no known symptoms other than that of the underlying supratentorial process. Variably, it can improve or resolve over time.1,2 The interpreting physician must be aware and recognize CCD when encountering decreased cerebellar uptake contralateral to a cerebral process to avoid misdiagnosing additional pathology in the cerebellum. Mettler FA, Guiberteau MJ. Central nervous system. In: Essentials of Nuclear Medicine Imaging, 6th ed. Philadelphia, PA: Elsevier Saunders; 2012:79-81. Shih WJ, Huang WS, Milan PP. F-18 FDG PET demonstrates crossed cerebellar diaschisis 20 years after stroke. Clin Nucl Med 2006;31(5):259-261. Wong K, Swoffor DM. JAOCR at the Viewbox: Crossed Cerebellar Diaschisis. J Am Osteopath Coll Radiol. 2018;7(1):34. Kevin Wong, D.O., Michael Swofford, D.O. Dr. Wong and Dr. Swofford work with the Department of Radiology, Garden City Hospital, Garden City, MI.